This is Buddy. He lives in Woodbridge, Connecticut with his mom, Andrea Latham. 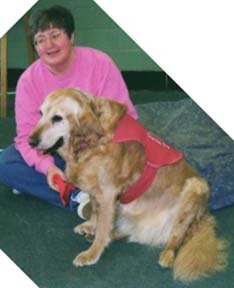 Buddy started as a therapy dog three months before he turned 10 years old (who says you can't teach an old dog new tricks). Buddy will be 14 years old this November (2003). 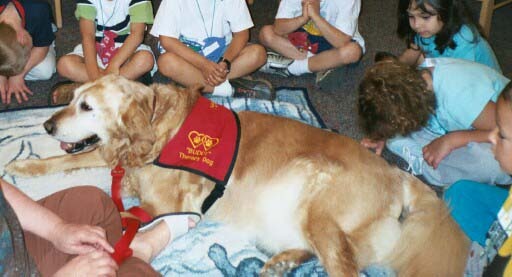 Recently, Andrea asked her sister who teaches second grade if she could bring Buddy to the class for the children to read to him. And, she asked her roommate's sister, who tutors children at another school, if Buddy could come and work his magic. Of course, Buddy visited both schools and was a hit. For his school visits, Buddy doesn't have to walk as much as he is required to do in hospitals. But, he still easily brings smiles to everyone and the children can't wait to read to him. What a handsome boy he is, even at the grand old age of 14. Just look at how dapper he was in his 2004 Halloween outfit. 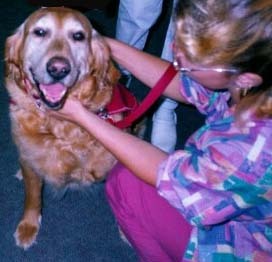 This photo of Buddy was taken at Griffin Hospital in Connecticut a month after he had surgery on the inside of his nose in order to remove a cancerous tumor. He had just finished visiting patients for the day. Buddy comes back to the nurse's station for his payment of biscuits and belly rubs. This picture was taken in September 2002 when Buddy was 12. All the staff members love to have their picture taken with Buddy. Buddy was actually ready to go back to work a month after his surgery, loving to visit both patients and staff. And, doesn't Andrea look like such an adoring mom here with her special guy?